Before there can be a beginning, there must be an ending. Every beginning begins with an end. And after every end, there is a beginning. All continues. Rather than seeing Solstice as the “shortest or longest” day, I see it as the day at this time of the year when the days begin to get shorter in the Northern Hemisphere. A time of introspection. A time to begin preparation. A different kind of enlightenment. For those in the Southern Hemisphere, this is the day of the year when the days begin to get longer. More light. More enlightenment. Clearer vision. The Solstice has been celebrated for eons. We cannot find the beginning of this practice — it has always been and always will be here on Earth. 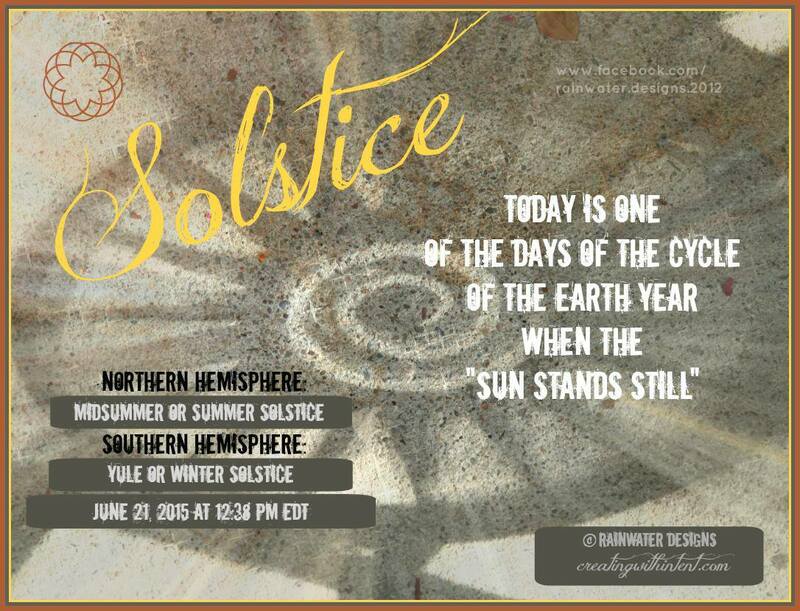 Solstice is part of and clarifies the cycle of life. This is a perfect time to clear away the unwanted from your life, from your home, from your mind. Instead of doing all of your “spring cleaning” or tossing things at the “new year” or even waiting until Mercury Retrograde (next one is in September), try doing some of the cleansing at Solstice time. Do an inventory. Be honest. Clear away. Sweep. Rearrange. See it as a planning time. Breathe deeply the newness of life. Stand in more Light each day, whether it’s the Sun or the Light of your Being. Posted on June 22, 2015, in Uncategorized. Bookmark the permalink. Leave a comment.